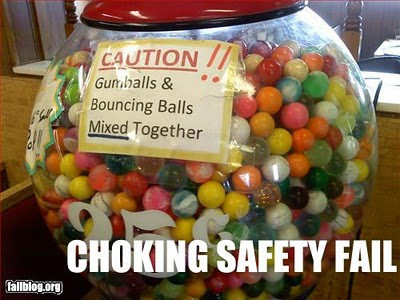 In True Confections, Alice makes more than one terrible mistake with candy products. She takes responsibility for neither the Bereavemints fiasco nor the regrettable packaging decisions about Little Susies. Had I glimpsed this ill-conceived gumball machine while I was writing the novel, Alice would have mentioned it as an example of mistakes made by others. 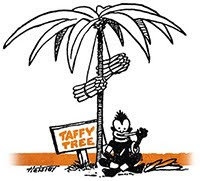 And here is the original Abba-Zaba baby, sitting under a taffy tree. Extraordinary, isn't it? But during a recent idle internet search (the number one procrastination tool of today's writer), I found them at last, newly posted at a candy wrapper museum website. 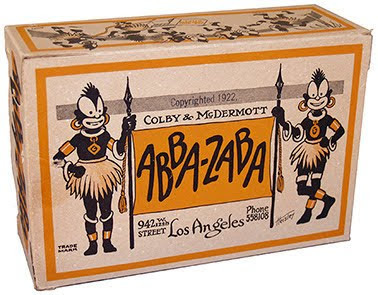 Looking at the original Abba-Zaba savages, I am even more convinced that I am correct in my theory that the name of this candy was based on a kind of made-up imaginary Zulu jungle savage utterance. Look at the picture, and say the words Abba-Zaba. Again. Again. Abba-Zaba, Abba-Zaba! Listen. Can you hear the jungle drums? The natives are restless! PUBLICATION DAY FOR TRUE CONFECTIONS! Today is publication day for True Confections! In an alternate universe, my novel has another title, my working title for years -- Temper. 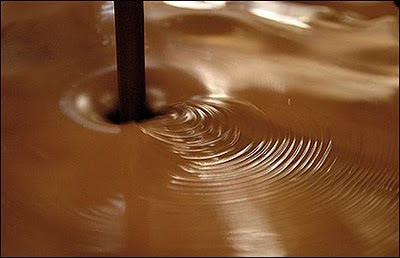 I liked the word for all its possible meanings, from mood and anger to the process of tempering chocolate, which requires strict control of temperatures while first heating and then cooling chocolate so that the molecules will form a uniform crystal structure, which is what gives good chocolate its glossy shine and its "snap." (Badly tempered chocolate is dull and lumpy and snapless.) So I loved all the metaphorical possibilities of the title Temper. But my editor said No dice! And he was right. We brainstormed through dozens of titles and finally I returned to one of his first suggestions, True Confections, which is just the right title for the novel formerly known as Temper. Today's New York Times has a delightfully informative obituary for Curtis Allina, the leading candidate for the distinguished historical achievement that helped makes Meg Whitman all she is today -- dreaming up the notion of putting character heads on Pez dispensers -- or at least, Allina was the one who made it happen. (The first two, in 1955, were Santa Claus and a character called Space Trooper.) The original Pez product was, according to the New York Times, meant for adults, and the container was designed to resemble a cigarette lighter, which makes sense, because the original Pez mints as conceived in 1927 by Eduard Haas III (the New York Times calls him "a Viennese food products mogul") were intended both as breath mints for smokers and as an alternative to smoking. (The name Pez is a slangy contraction of pfefferminz, the German word for peppermint.) I wrote quite a bit about Pez in True Confections, and I consider myself Pez-knowledgable, but I didn't know then what I know this morning, about the original packaging. RIP, Mr. Allina. You made your mark on civilization.